Definition WordPress Theme is a clean and responsive business theme with eCommerce functionality. Definition WordPress Theme comes packed with useful features like featured slider on homepage as well as widget-ready homepage, WooCommerce powered shop and WooDojo integration. Definition Theme offers typography settings to choose suitable fonts from Google Fonts and some styling options to define perfect background image or color. Other features are “Testimonials by WooThemes” that can display your clients testimonials on the homepage area and “Features by WooThemes” to showcase company service or products on frontpage. This theme has 1 widgetized sidebar and up to 4 footer widgetized areas, and as always comes with custom Woo Widgets (Ad Space, Blog Author, Video/Embed, Subscribe & Connect, Search and Flickr). 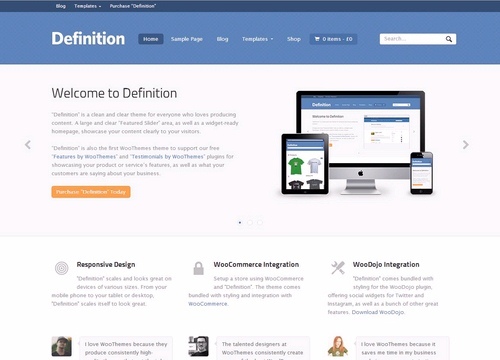 Planning to buy Definition theme from Woo Themes. Buy with Confidence. This page provides you with all possible Buying options. Usually Buying options or Pricing page of any theme designer is designed for conversions (to attract users and convince them to buy). Our Buying options page is not like that. We provide all the information about each Buying option. No hidden text or terms. We tried to cover everything that you should know before buying this theme.